Do you like wine? Of course you do. Over the summer I helped a friend who distributes wine and liquor by running tasting events near my house. Essentially, I manned a table and poured drinks, extolling the virtue of the evening’s selections — bartending with a sales bent. The first time I ran a tasting, I noticed that we were pouring various whites and reds into standard, plastic 9 oz. cups. 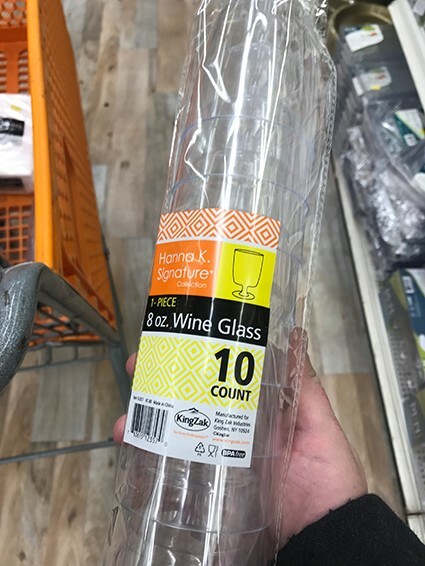 The designer in me wondered if using those cups was the ideal experience for distributing and enjoying wine, particularly to wine enthusiasts. Aside from the divergent aesthetics (plastic vs glass, which I could understand from a cost-savings perspective; the distributor ran several tastings across the city during any given week), I’d often heard one should never hold a wine glass from the bottom, but rather hold by the stem or side to adequately swirl and ensure minimal temperature change to the wine. At home, I have several kinds of wine glasses — stemmed, tumblers, etc — multiple “user interfaces” for drinking wine. My question, as a sporadic wine drinker and host to a specific experience catered to qualified wine enthusiasts, then became a bit clearer. I set an exercise for myself: cost not being an option, what would the best glass type (interface) be for my friend to offer his users at the next tasting (experience) — a stemmed container or one without, like a tumbler? Wrapping hand around the glass. Careful not to bring my personal preferences to the mix, I managed to survey 31 potential users (27 of the 40 at the event, 4 online), learning how they preferred to hold their wine and why — acquiring a specific range of grouped explanations listed below. Discounting the percentage of users who were not invested, and would drink the wine no matter how it was poured, this felt like a clear indication that most qualified users preferred a stemmed glass versus a tumbler, so that they could maintain temperature and perhaps leave their prints off the glass (this response could change depending on whether or not they got to keep said glass, of course). 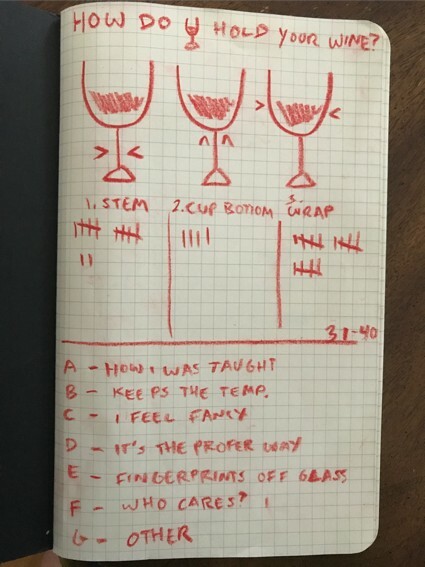 In addition, only one Inherited user had an emotional connection to data set 2, Cupping the Glass, but a stemmed glass could potentially satisfy all users: those from Set 1 could hold the stem, Set 2 users could still cup, and Set 3 users could wrap. A tumbler, conversely, would not be ideal for those in Set 1, specifically for the very important practical response and thereby could create a negative response in the end-user. In the end, I realized my wine study had little to with identifying the best type of glass. It had more to do with employing UX skills and data to solve even for the mundane, commonplace experiences of my life. Whether in trying to decide on the best wineglass, choose the right car, or even figure out the best outfit to wear for a specific event, there’s an inherent (sometimes less involved) structure throughout: identifying a problem; gathering and measuring pertinent data; discovering and employing a correct solution based on external requirements and then iterating for the future. When we speak of Design Thinking, whether a designer, businessperson, housewife or what have you, I believe what we mean is using empathy and data to ask questions and create a plan, iterating upon it to solve a problem and make someone’s life better. The problems could range in perceived scale: they could be as large as conceiving a company’s new digital/mobile strategy, overhauling the way a business onboard new employees, but it also remains close to home, like trying to choose a new car, redecorate a room, or decide on the best wine glass. Doing one’s best to understand human needs (even your own), to gather pertinent data and ask questions and then identify one or more potential solutions with the understanding that each person might interpret them differently (and potentially require iteration, polish and rewriting to achieve an intended goal) is not only at the root of design, but life itself. Hopefully, now my friends and family have a better handle on how to — at even a basic level — arrive at more desirable experiences for their own lives and in their homes. And if not…well, at least now they can enjoy a glass of wine under better, if not ideal conditions.